Valentine’s Day is just around the corner and we’re getting into the spirit of the season by updating our home décor! We’re swapping out our regular décor for a cute Valentine’s Day gallery wall that’s stylish, low-cost and super easy to put together! Read on to download our FREE printable gallery wall art and find out how to install your beautiful gallery wall without damaging the walls! Use a spirit level. No-one wants wonky picture frames, so use a spirit level and a pencil to mark a faint line on the wall where you want your pictures to hang before you attach anything to the wall. (But the beauty of VELCRO® Brand HANGables® Removable Wall Fasteners is that they peel off the wall easily so you can re-position your frames if you need to. Plan your layout. We’d recommend experimenting with different layouts by laying your frames out on the floor before you hang anything on the wall. 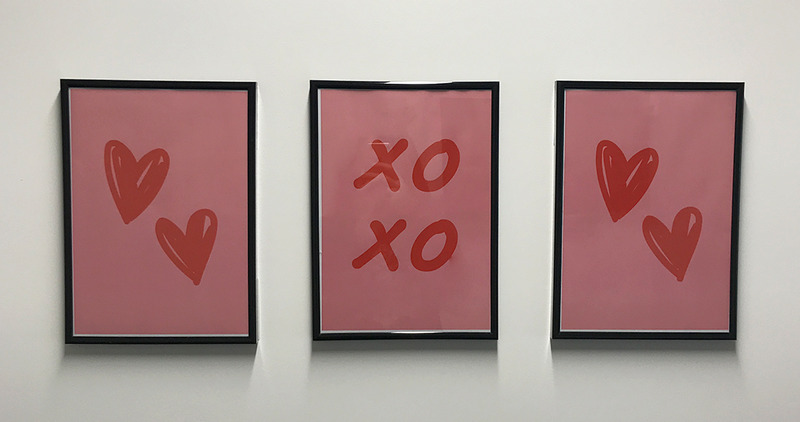 Start by downloading our free printable Valentine’s Day gallery wall art (we have a hearts & XOXO design). We used three black frames for our gallery wall but remember you can use more or less frames depending on the look you want to go for and how much wall space you have to fill. Next, pick your frames! You could go for a uniform look with three picture frames that are all the same shape, size and color or mix and match different styles! It’s completely up to you. Layout – do you want a uniform, symmetrical layout? Or a more abstract, haphazard look? 4. Hang your Valentine’s Day gallery wall! 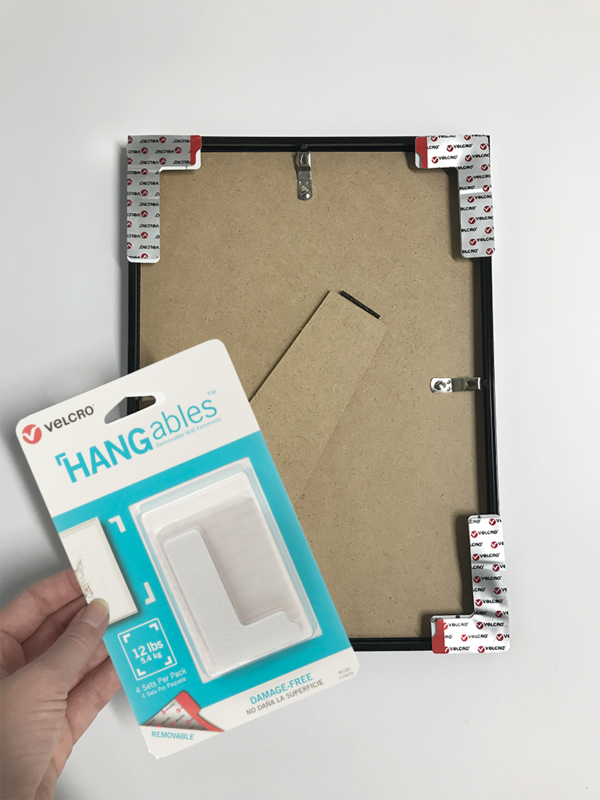 We’d recommend using VELCRO® Brand HANGables® Removable Wall Fasteners that are removable and peel off easily when you want to take your picture frames down. (They’re also perfect for anyone who wants to re-position their gallery wall as you can peel the frames off and stick them back on again). 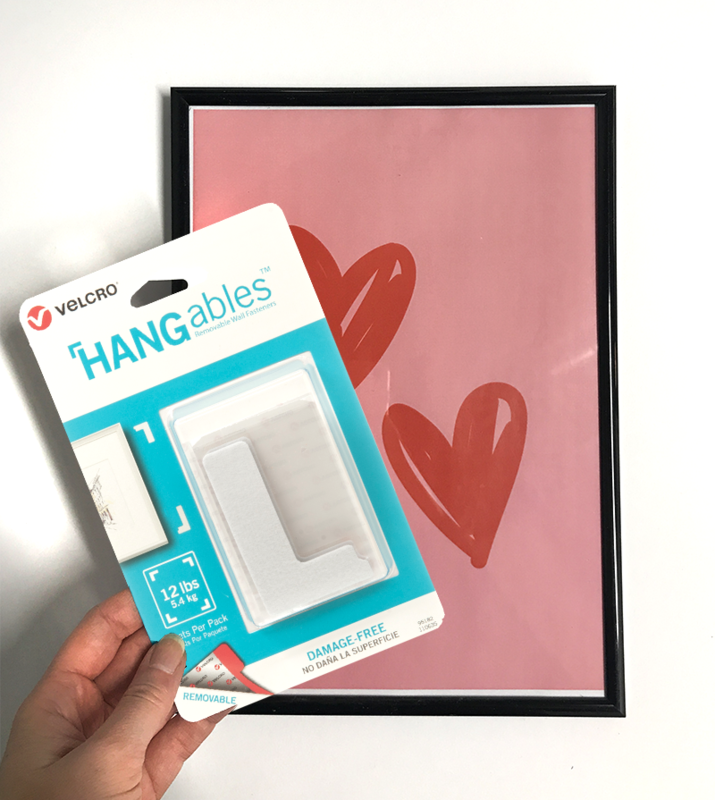 You’ll need four sets of VELCRO® Brand HANGables® Removable Wall Fasteners per picture frame to hang your gallery wall without nails. And they’re super quick and easy to use! Stick one set in each corner of the frame, rub it for 30 seconds and then press the frame firmly against the wall. Slide the frame up and off the wall, and then leave them for one hour while the adhesive bonds with the wall. Easy, right? And that’s how quick and easy it is to make a beautiful Valentine’s Day gallery wall! Shop VELCRO® Brand HANGables® Removable Wall Fasteners on Amazon or stay on our blog for even more home decor ideas!